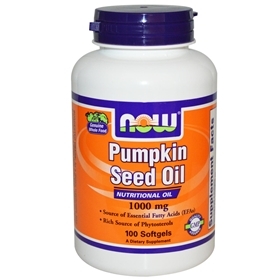 Pumpkin Seed Oil is a nutritional oil rich in essential fatty acids (EFAs). Pumpkin Seed Oil is also known for its high phytosterol content. Scientific studies show that the phytosterols present in Pumpkin Seed Oil provide support for a healthy prostate. NOW Pumpkin Seed Oil is unrefined and derived only fromt he highest quality expeller-pressed pumpkin seeds. Pumpkin seed oil benefits the reproductive and urinary tract area of the body. Studies are constantly being done in relation to these nutrients having beneficial effects on BPH - Benign Prostatic Hypertrophy or enlarged prostate. The fatty acid and plant sterol content of pumpkin seed oil might account for the improved function of the bladder and urethra, which may account for BPH symptom relief. The nutrients in pumpkin seed oil affect kidney stone formation by reducing levels of substances that promote stone formation and increasing levels of compounds that inhibit stone formation. It is commonly been used to treat a variety of kidney problems as well urinary problems, gastritis and the expelling of tapeworms and roundworms. The lubricating effects of the essential fatty acids and antioxidant content are the likely reason relief is found by arthritis sufferers. These same nutrients are also lower the overall blood cholesterol content by lowering LDL (bad cholesterol) levels and increasing HDL (good cholesterol) levels. The antioxidants in the forms of Vitamin A and E are also useful in maintaining skin health. Suggested Usage: As a dietary supplement, take 2 softgels, 1 to 3 times daily with meals. Consider taking this product in combination with NOW® ZMA®, Pygeum & Saw Palmetto and Nettle Root. NOW® Pumpkin Seed Oil delivers the natural nutrient profile found in Genuine Whole Foods. You’re standing there with a bottle of supplements in your hand, staring at the label with doubts and questions racing through your mind . . .
You’ve read articles, listened to friends, asked your doctor . . . but you’re still not sure. Literally thousands of published peer-reviewed scientific studies demonstrate supplements work. From professional athletes to moms, more and more people are enjoying the benefits of including nutritional supplements in their daily routine. An increasing number of health professionals recommend them as part of the growing field of integrative medicine. However – that being said – in order for supplements to work the way we hope they will, supplements need to meet four specific criteria . . . When it comes to being certain about whether a supplement works, clinical research is your best reference. Some supplement ingredients, like glucosamine for joint support, for example, have hundreds of studies behind them, including dozens of clinical trials. Some of this research reveals certain ingredients do not work as well as we expected for specific areas of health. On the flip side, much of this research shows nutritional supplement ingredients work exceptionally well in helping you stay healthy. Of course, this research is just the beginning. Many supplements with a long history of traditional use have not been studied enough by science. This doesn’t necessarily mean they don’t work. It simply means the data confirming their reported benefits has not been collected yet through laboratory or clinical research. You can find out more about the science behind NOW products here. It doesn’t matter how much scientific evidence shows an ingredient works. If you mix up ingredients, use the wrong potency, or use contaminated ingredients, your product won’t work as you expect it to. For this reason we pay particular attention to testing our ingredients using our world class labs. While the Food and Drug Administration’s (FDA) Good Manufacturing Practices (GMPs) require all companies to test their ingredients, they still don’t cover the level of testing we maintain. Few companies match our meticulousness. To find out more about how our in-house laboratories make such a difference, just go here. To find out more about how NOW goes beyond compliance with GMPs, go here. To see what we mean when we say, “What’s on the label is in the bottle,” go here. Good research and lab equipment don’t do much good if we don’t have qualified staff. With a tremendous depth of qualifications and experience our staff can tap into the best research out there. Better yet, they set the standards! NOW’s team has developed lab techniques that have become industry standards. Find out more about our exceptional staff right here. You may be a savvy consumer, researching and reading labels carefully. But if the label misrepresents ingredient identity or the concentration of certain ingredients . . . or leaves out ingredients entirely . . . you won’t get the results you’re expecting. Plenty of consumers have been disappointed when they take supplements that don’t match what’s on the label. That’s why we take so much care when we create our labels. If you’re expecting 200 mg of resveratrol as natural trans resveratrol, for example, that’s what you should get in the bottle. To find out more about our industry-leading labeling system, just go right here. Ready to browse our selection of exceptional products that work? Click here to get to our main product menu.